In a topsy-turvy Class C1 football contest that featured rallies by both teams, Columbus Lakeview tallied the game’s final points and stunned host Boone Central 27-21 in overtime. The Cardinals surged to a 14-0 lead in the first 16 minutes of play and held a 14-7 lead into the fourth period. Lakeview turned the tables with a pair of quick touchdowns to take a 21-14 edge with just over six minutes to play and Boone Central bounced right back to tie the score with 3:40 remaining. The Cardinals had one more chance at victory in regulation, but failed on a last-second field goal attempt. Boone Central missed another field goal try to end its overtime possession and Lakeview delivered the final blow with a 10-yard TD run by junior halfback Preston Luedtke. 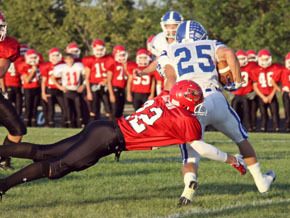 Boone Central (1-1) coaches felt their team made progress from its season-opener, but came away from the contest feeling the Cards had missed some opportunities. “We actually did a number of things better than the week before. We need to build on those and make more improvements in the week ahead,” commented Cardinal Coach Arnie Johnson. “I don’t think we’ve run 75 offensive plays in a game in a long time. “However, we need to come up with ways to finish when we get inside the red zone. Defensively, we need to get people to the ball and do a better job finishing the play when we get there.